Even though convicted thief Jean Valjean (Hugh Jackman) has served his time, he soon learns he is not truly “free”. As he is told by inspector Javert (Russell Crowe), Valjean will be on parole for the rest of his life, forever branded as a thief by his identification papers. Not surprisingly this makes getting a job or even lodgings difficult, and creates a self fulfilling prophecy of sorts that the one time criminal will never be anything but. However, when Valjean gets caught after stealing from a church that had given him sanctuary, the Bishop lies for Valjean. He tells the arresting officers that he had given the loot to the man, an act of kindness that sends the ex convict on a journey of redemption. LES MISERABLES is the musical story of that journey. Valjean breaks parole and sets about turning his life around under an assumed name. While doing so, he inadvertently allows harm to come to single mother Fantine (Anne Hathaway). 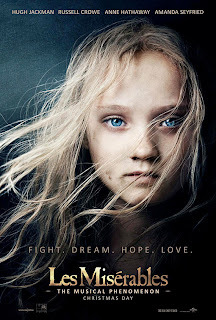 Once he realizes what he has done, Valjean vows to take care of Fantine's daughter Cosette (Isabelle Allen as a child, Amanda Seyfried as an adult). Meanwhile, Javert crosses paths with Valjean once again and recognizes him for who he is, vowing to make him pay the price for breaking the law. This being a 2 hour and 40 minute film based on one of the longest novels in history, let's just say there's a good deal more plot beyond what I've already summarized. In additon, LES MISERABLES is also a musical. And not one of those musicals were people talk most of the time and then break into song every now and then. No, this is more akin to opera, with just about every syllable being sung. That may or may not be your cup of tea, I'm just giving you fair warning. Considering how much singing takes place in the film, it's a good thing that most of the songs are memorable and the cast is up to the task of performing them. Hugh Jackman of course is well known for his work in musical theater, but people forget that Crowe has considerable singing experience as well, having fronted various rock bands since the nineteen-eighties. These two get the lion's share of songs, and acquit themselves admirably. And really, pretty much everyone in the cast does a good job with the singing. Even Sacha Baron Cohen as shady innkeeper Thenardier, who often performs in concert with SWEENEY TODD alumni Helena Bonham Carter as his wife. The film's central theme is the conflict between blind obedience to the law and authority as exemplified by Javert with a more morally relativistic philosophy that says sometimes one must break the law for the greater good, as exemplified by Valjean. This was a controversial notion when Victor Hugo wrote the book that inspired the musical this film is based on, and it continues to be so to this day – one need look no further than American politics to see that is the case. LES MISERABLES makes a fairly convincing argument in favor of a less black and white view of good and evil, and may still ruffle the feathers of those who see the world in more absolute terms. Unfortunately, there's a vapid love story thrown into the mix involving Cosette and a young French revolutionary named Maurius (Eddie Redmayne). It's love at first sight, of course, but we never really get a sense that these two have any real connection. But we need a love story in a musical like this, I suppose, and so we get one. Also undermining the more serious ideas in the film is the ending, which tries to put a happy, all-singing, all-dancing spin on what is otherwise a pretty grim tale. There is a far more satisfying, and in its own way uplifting ending just prior to the final musical number, and it would have been better had the movie ended there. Of course this film is an adaptation of a long running and highly successful stage musical, and my gripes may well be inherent in the source material. I haven't seen the stage production, nor read Hugo's novel, for that matter. Whether you consider that an asset, as I can view the movie on its own terms, or a detriment, as I have no way of reporting on whether this adaptation is faithful or not to its other incarnations which you may or may not have a fondness for, I leave to you to decide. All I can say is that the film I saw, while undeniably well made and performed, was kind of a dreary bore. 2 1/2 out of 4 stars.